Many of my vacations truly are "working vacations". Yes, we spend three weeks in France, but we are visiting wine makers, cheese producers and the like. Yeah, I know, tough job but someone has to do it. I can't complain. I do work at hunting out products . Much like the truffle pig, I am always sniffing around, looking in local shops, watching what the locals are eating. Of course this often means eating and drinking many things to be assured of quality - I never just take someone's word for it- but that is another story altogether. When I eat a cookie I like in Italy, I will find out who imports it to the U.S. I am quite vigilant. This is just the best way to bring my customers items they might not find otherwise, such as many of the wines we have in our shop. Sometimes I find them through a focused tasting or meeting wine makers. Sometimes greatness just falls in your lap, almost like Divine Intervention. Forces were at work when we discovered the lovely wines of Jacky Blot: Domaine Taille aux Loups (whites) and La Butte (red). The Intervention came by way of a kindly Paris wine shop owner, Christophe Vidal. While we were buying some wine from his shop, I noticed some odd whiskeys from Japan which started up a conversation (and some sampling of said whiskeys, did I mention how nice this guy was?). In our discussion of the wine business, we mention that we are planning to visit a winemaker or two in the Loire Valley. As we are about to leave we hear a shout. He comes running up to us with an open bottle of wine. 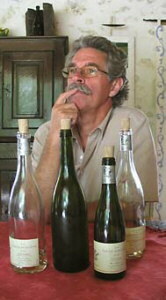 Turns out that the winemaker, Jacky Blot from the Loire Valley, had been in his shop earlier for a tasting of his wines. Jacky had left an open bottle but Cristophe didn't need it, perhaps we could take it back to our apartment and enjoy it. We took our Taille aux Loups wine, happily skipping back to our apartment and marveling at the kindness of strangers. showing us their sparkling wine. The wine is a delightful surprise. Chenin Blanc grapes, light, crisp, wonderfully balanced. What a nice gift! Wally, ever diligent, looks up the winery and I can see he is contemplating, actually becoming determined, to find the winery in our travels. We move on to the Loire and are having dinner in the city of Tours when, lo and behold, the Taille Aux Loups is on the wine list by the glass. We have to order it, and yes, it is as good as we remembered. Okay, that settles it, we have to find this winery. After a few days of trying wines in Chinon and Saumur (both great cities to visit and sample wine), we track down the winery Taille Aux Loups. We drive along curvy roads, follow the river (because we don't know exactly where it is) along the south bank of the Loire east of Tours. Eureka, we find it! 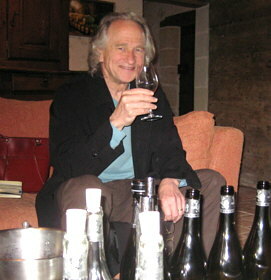 Jacky's daughter Fran�oise greets us warmly as we come in from the rain, and sets up quite a tasting for us. We try sparkling wines, the whites that we love, and reds from nearby Bourgueil. It is quite fantastic, especially since we don't even have an appointment. Jacky pops in and gives us an exuberant hello, but he is quite busy with a bunch of clients in another room. We write down the name and phone number of their distributor in California and buy some bottles to add to the collection we have amassed during the previous few days. We high five ourselves once we get in the car, feeling the excitement of another successful hunt. We rub our hands in anticipation of tasting this wine for our clients back home, and hope that the distributor, Adventures in Wine, carries the wines we want. We have never bought from them before, or even heard of them. We return to our Paris apartment a few days later with our cache of prized wines. I really want to serve Jacky's wine at our upcoming tasting in two weeks. I need to email my assistant Dave to find this company. As I am looking in my purse to find the business cards from the wine makers we visited, I find a card for Adventures In Wine! I have no idea how it got there. I don't remember ever meeting the person whose name is on the card. There is no other business card from America in my bag, having cleaned it out before we left. Françoise at the winery did not give me a card, she just had me write down the name in my notebook. But here it is. Magic! That did it. We were obviously destined to have this wine in our shop. The importer has the whites I want, not the reds, but they are ordering them for me. So with this happy set of circumstances, I am able to offer this fantastic wine to our customers. And it all began because I had noticed some odd whiskeys at a Paris wine shop and started asking questions.